7 extra thick EVA Foam nail file with up to a 4 color process imprint on one side included in price*. Beats old fashioned emery boards every time. Clear vinyl sleeve also included in bulk. 2nd side imprint available at additional charge. Can be used as a creative business card. Setup Charge: 55.00 for one-sided imprint or same artwork used on both sides.If 2nd side imprint is a different image, add 55.00 setup charge. PMS Color Match Charge: 32.00 per color, not available for 4 color process imprint. Email Proof Charge: 7.50, add 2 days to production time. Imprint Area: 6-3/4" x 1/2"
Disclaimer: Imprint on top of grit subject to normal wear and tear which is not considered a defect. Digital Personalization: add 0.30 running charge, plus setup charge. Additional Location: add .30 running charge, plus setup charge. 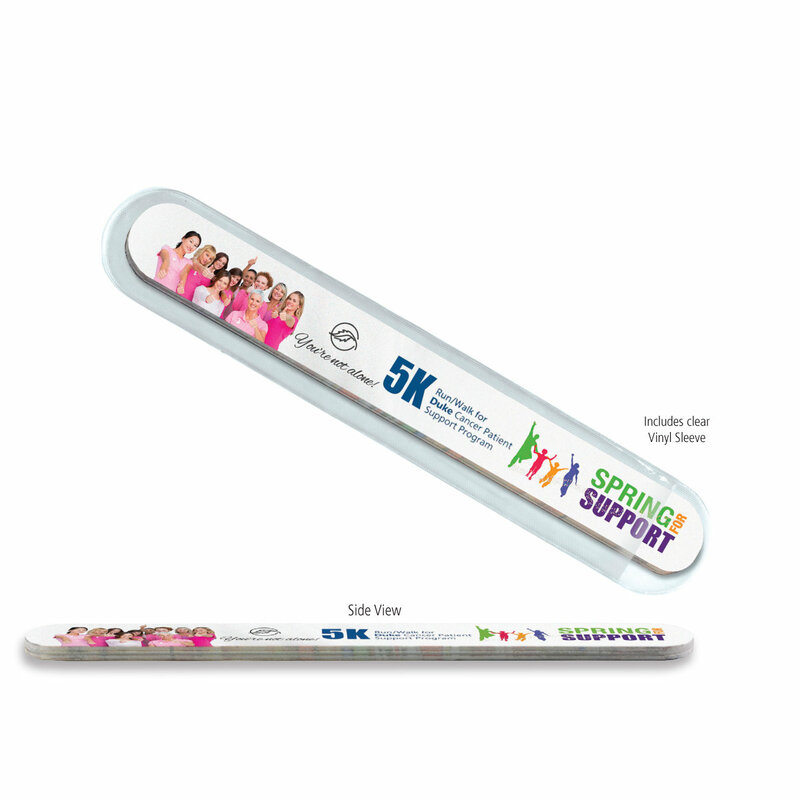 Price Includes: Up to a 4 color process imprint on one side of nail file. 2nd side imprint is available for additional charge shown in price chart. Exact color match is not guaranteed. Please note nail files and vinyl sleeves are packed bulk separately. To insert files into vinyl sleeves please add .25 each and specify. Please Note: Exact PMS color match cannot be achieved when printing digitally on the surface of nail files. E-Proofs are only a color approximation of actual CMYK digital printing and will not match printed product exactly. Pre Production Proof: Domestic Item: $45.00 (G). Production Time: 2-3 Days. If revisions are made to any Pre Production proofs, a new pre production proof charge that includes any additional art, die or screen charges will apply.